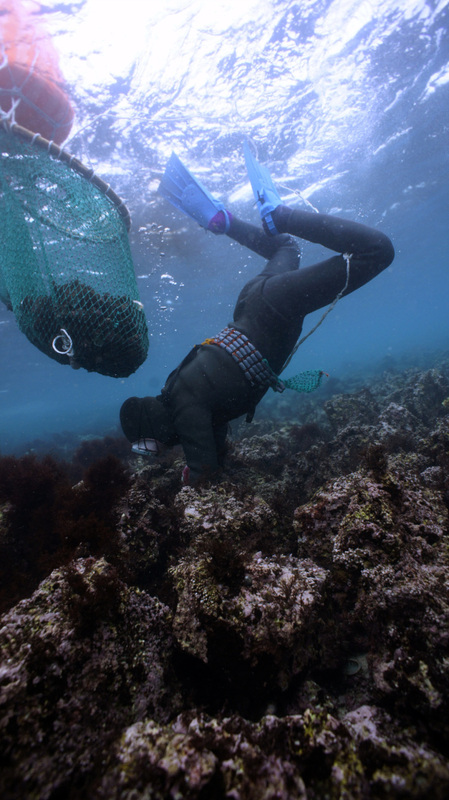 When the female divers of Jeju Island emerge from their minutes-long foray underwater, they let out a much-awaited sigh. Called “sumbi,” the exhalation releases carbon dioxide from the lungs with a sound that is similar to whistling. When the divers pop up in groups, a chorus of singsong breathing echoes through the coast. 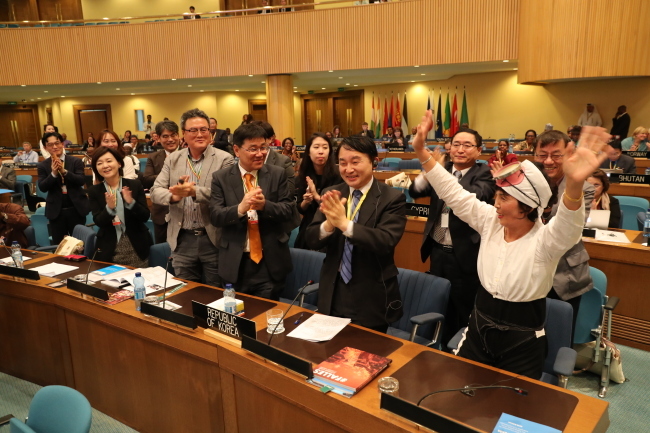 “Haenyeo,” or women divers who have been diving in the waters off Jeju for centuries to gather seafood, were inscribed onto the list of Intangible Cultural Heritage of Humanity by UNESCO on Wednesday during the 11th session of the Intergovernmental Committee for the Safeguarding of the Intangible Cultural Heritage in Addis Ababa, Ethiopia. The inscribed haenyeo culture consists of “muljil,” diving techniques that involve no oxygen gear; “jamsu-gut,” a pre-diving shaman ceremony praying for safe dives; and the “haenyeo norae,” songs that divers sing aboard boats heading out to sea. The committee said haenyeo culture deserves international recognition for preserving the region’s traditional rituals, passing down technical know-how for generations, following eco-friendly harvesting methods and empowering women. “The breaths she held became rice, became her husband’s drink, and became her children’s books,” a voiceover says in “Breathing Underwater,” a documentary spotlighting haenyeo by Ko Hee-young, released in September. 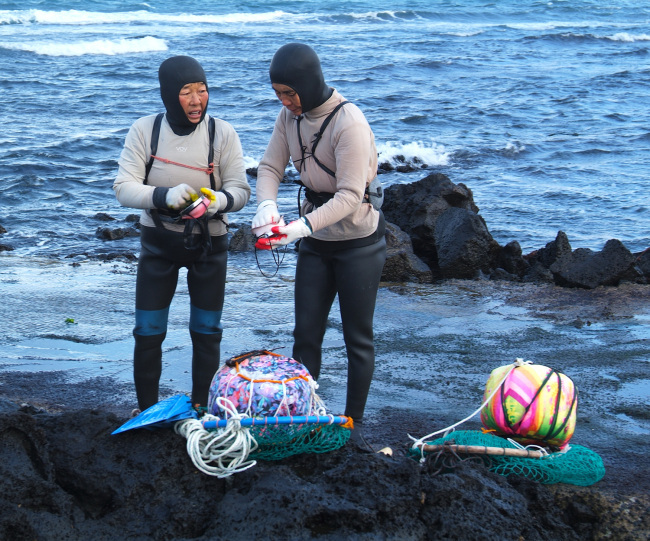 Since the 17th century, female divers have been making ends meet by gathering marine products like shell fish, abalones, sea urchins, and seaweed from the sea bed, according to Choa Hye-kyung of the Jeju Development Institute. “Back when there was no other industry on the island, and when women weren’t educated, it was the only way they could provide for their families,” she said. Both men and women engaged in diving for marine products back then, before the island developed a booming mandarin orange farming industry. “Your eyes are greed, which you must control.” Such wisdom, along with extensive knowledge of the sea bed, are carried down orally, generation after generation. Wearing only a black rubber wetsuit, haenyeo plunge into the water for up to 3 minutes at a time with no additional breathing apparatus and carrying only rudimentary fishing tools -- a bowl for scooping and a net for storing the harvest. They gather seasonal products -- sea cucumbers from January to June and August to December, and abalone from January to September. Few younger women are joining the trade nowadays, however, due to the availability of other jobs and coastal pollution, which has led to lower yields from the sea. According to the Ministry of Maritime Affairs and Fisheries, there are 4,415 active haenyeo as of 2015. Over 98 percent are older than 50. In 1965, there were as many as 23,810 haenyeo in Jeju, according to the Academy of Korean studies. “The UNESCO designation is significant, shedding light on the waning trade and letting haenyeo take pride in their work,” said Yoo Chul-in, a professor of anthropology at Jeju National University. The Cultural Heritage Administration also hoped that the haenyeo culture, unique to Korea, would gain fresh attention around the world, it said in a statement. Jeju Special Self-Governing Province will continue efforts to preserve the culture through research projects and support for the haenyeo school, which was established last year. A celebratory event will take place on Dec. 14 at the International Convention Center Jeju. The haenyeo culture listing came almost three years after Korea applied for the listing in March 2014. Present at the committee session Wednesday were officials from the Jeju Special Self-Governing Province, along with a delegation consisting of officials from the Ministry of Foreign Affairs, the Permanent Delegation of the Republic of Korea to UNESCO and the Cultural Heritage Administration.